The Princess Challenge is simply a marvellous event, which raises much-needed funds for the Scarborough & Ryedale Mountain Rescue Team. It sees a range of distances offered – the Short n Sweet, the One in the Middle and for me, the Ultra. 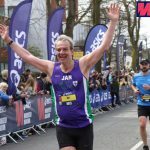 I ran this event in 2017 as part of my training for a longer event and followed a similar plan this year. The summer had been warm, and although I had run plenty, it had been a blend of shorter distances. On holiday in France, I knew the Princess was indeed going to challenge me if I didn’t prepare adequately, so I started to step things up. Upon returning to the UK, and some two weeks out I did a long training run of 30km, having gradually worked my way up. Training was going well, and I felt confident. To throw another couple of things into the mix, I had decided to buy some new shoes (Hoka Speedgoat 2) and christened them on a 6km trail run during the week running up to the Princess. I also had just taken delivery of a new watch (Garmin 935) and the evening before the race, I experimented with it walking a couple of km to and from the car park at Kynren. I wouldn’t say I was that well-rested – apart from the late evening before the race at Kynren, I had also just returned from a mid-week work trip to Germany. On the morning of the event, I woke, got some porridge down and set off to the event nice and early (the rest of the house still in bed). After parking up I entered the village hall and saw Carole helping with the registration – I must have looked a sight, and felt still half asleep. I submitted myself to the necessary kit check, fastened my number and settled my head, reflecting on the announcement of the day before, “…there will be cattle movements on part of the Ultra and Middle route! This will be at 10 am on part of the diverted route! If you get there after that you will be held by the marshal at Pittard Point until safe to proceed. It means you have to run the first miles…Sorry”. Deliberations were suspended as we lined up, and Kathryn joined me, keen as ever for a selfie! So, in contrast to my original plan that this was to be ‘just a training run’, I decided to set off a little more swiftly to ensure I didn’t encounter the cattle. I was definitely a bit further up the field than I should have been as I looped back to pass the Village Hall (start point) when I remembered I’d forgotten to put my gels in my vest – I had a 30 second argument with myself about whether I could make do, and then to the amusement of Kelly and the team, left the road, to dash into the hall, grab my gels and run back off down the road. 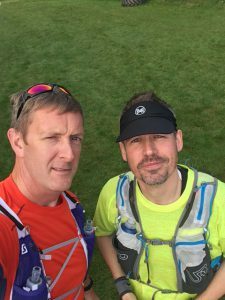 I soon caught up with runners from one of the other races that was underway and plenty of encouragement was exchanged along the first bit of the Cleveland Way, and then I was running solo for quite a while – without my wingman this year. I think it was after CP3 I met a chap who I ran with for a while towards Whitby. He had a groin strain but was ok to continue. 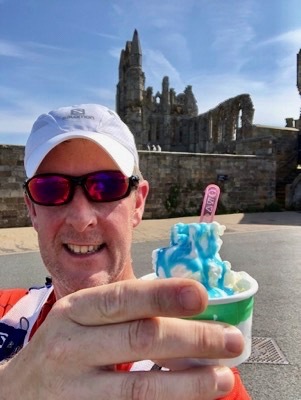 The temperature was getting up, and I remember running into Whitby which was in full swing with fish and chips, wasps and ice-cream (in no particular order). I knew that 199 steps lay ahead up to the Abbey and also that they would hurt. I decided my treat would be an ice-cream at the top – motivation aplenty! I made short work of the ice-cream and pressed on along the cliff path to CP4 at which point, I thought I was hearing things when the marshal told me I was 5th – ‘from last’, I quipped but he set me straight. Now, I knew I’d been pushing on a bit early in the race, and I also knew it was now warm and the terrain was to get a bit more challenging on the return. At CP5 (was CP3 on the outbound) I paused for more water and some amazing dandelion and burdock drink. The descent into Robin Hoods Bay total torture on the legs, I’m sure I looked a real sight to tourists seeing me thunder past, resplendent in my rather bright compression socks (and other clothing thankfully). No rest for the wicked and once at the bottom, the Cleveland Way beckoned again, past the aptly named Boggle Hole and Stoupe Beck with the many, many steps. 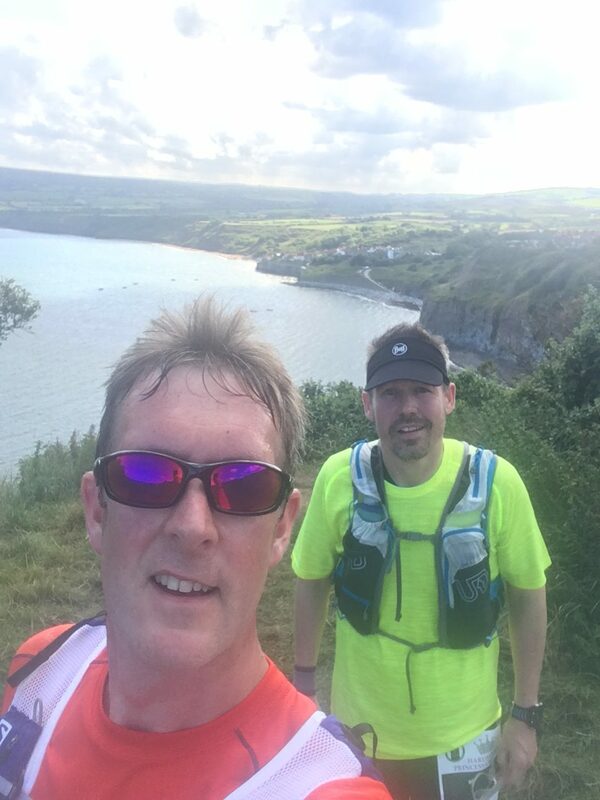 With the benefit of having run the route before, I pressed on and was passed by a couple of runners at some stage – most notably on the final ascent past the Alum Works to Ravenscar by a very capable lady who was no stranger to ultrarunning. 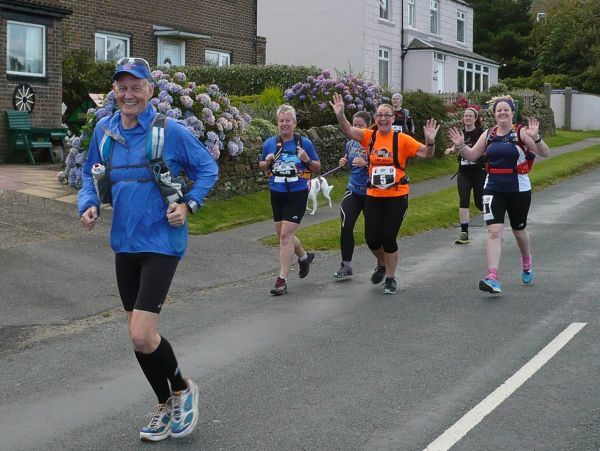 I could not maintain her pace, but kept going, climbing past the National Trust Café and up to the Village Hall – I rounded the final corner to see Kathryn again who hastened me towards the finish. The finish – it was confirmed I was 6th male, 9th overall with a time of 6:17:42 and a PB of over an hour! To say I was delighted was an understatement. Thanks to the SRMRT, marshals and organisers who give up their time to run such an amazing event. 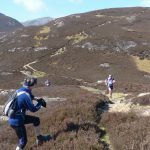 The Hardmoors Princess Challenge provides a choice of distance, with each option providing a challenge in their own right. The Short n Sweet (8.5 miles), the One in the Middle (17.5 miles) and the Ultra (31 miles). These races are not just for princesses, although wearing tiaras, tutus and pink garb is encouraged. I had a tiara set out but my daughter sat on it, although I did pack a pink Trail Outlaws buff as an alternative! 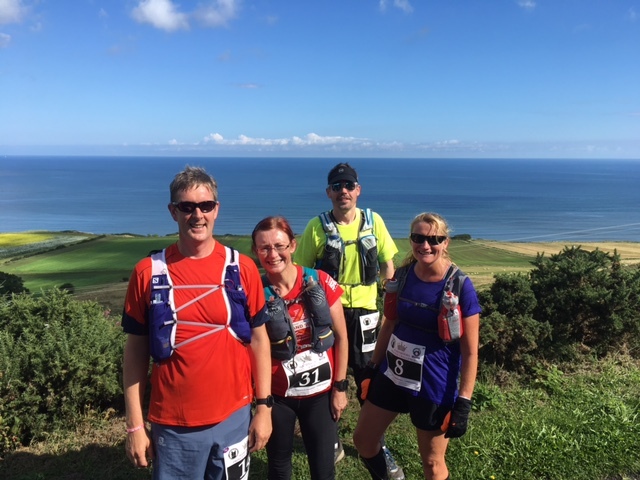 The Ultra was billed as a circular route, starting at Ravenscar, dropping South to Hayburn Wyke along the Cleveland Way, then along the Cinder Track (disused railway lines) via Ravenscar, continuing North to Whitby. 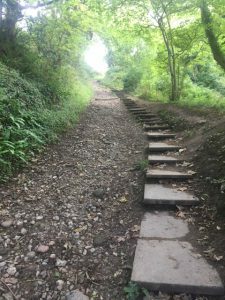 Taking in the 199 steps up to Whitby Abbey, the route returns along the Cleveland Way to Robin Hoods Bay, and finally back to Ravenscar. It’s a toughie in terms of elevation! I’m no mountain goat 🐐 but recently I’ve been falling more for trail than road. I can’t put an exact finger on the cause but it is connected to my endless pursuit of ‘fast’ times. I enjoy the sensation of running quickly and trying to beat my times. I had a great year in 2016, breaking all my targets (e.g. 5k, 10k, HM). Earlier this year my focus was on completing the Paris Marathon (oops, I’ve just remembered that I haven’t yet written a race report!). I started to wonder what happens if I go sub 4 hours? Do I then aim for sub 3:30, and do I keep going, or is there something else out there? 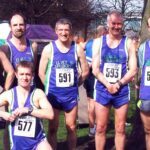 I’d never considered myself to be capable of running ultramarathons – maybe that doubt alone provided sufficient motivation. In any case, the prospect of the Hardmoors Princess 👸 Challenge captivated me. At 50km, it seemed a logical step up, and mindful of the added challenge of terrain, I entered the event with Andy (who had conquered the race last year). In terms of prep, this differed substantially from my rigid and detailed 12 week Paris Marathon plan. I run a fair bit usually and had done a 30km run (probably too fast) before going on holiday to France. Fortunately, I managed to keep the legs turning a fair bit during my holiday (probably too fast) but in the few days between my holiday and the race, I had a feeling of being a little underprepared. After a shopping trip on Friday afternoon to equip us with various snacks for the day, we agreed to set off at 0600hrs on Saturday morning. Andy was in charge of pacing, and my responsibility was to ensure we navigated adequately. Having bought an OS map, and armed with the route description, I set about marking up the map late Friday evening. I think I had just over 5 hours sleep (a little less than usual – the excitement aplenty) and then the alarm went off – fortunately, I managed to silence it, and cancel the reserve, and the 2nd reserve alarms prior to tiptoeing around getting my stuff together. And we were off – and in a little over an hour and a half, we were the second car into the parking field near to Ravenscar village hall. 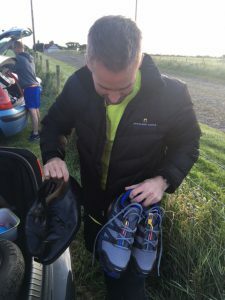 We had a few moments, so we examined Andy’s extensive shoe collection in his boot, and he opted for a trusty pair of well broken in Brooks road shoes, and a length of gaffer tape (just in case). A short walk to the village hall next, and we subjected ourselves to the mandatory kit check, prior to collecting our race numbers. You do have to take mandatory kit lists seriously given the terrain, and environment but I did think that if we really needed a head torch, we’d be in a bad place. Compared to road races, there was no limbering up, no strides, but there was a coffee van parked outside for those who required a shot of pre-race caffeine. Having packed and adjusted my vest, we were summoned to the race briefing outside. We then lined up on the road, had a quick photo taken, and we were off! I remembered all the advice from accomplished ultramarathoners of not setting off too fast, yet our initial downhill kilometre was 5:47/km. We slowed as we joined the Cleveland Way and headed South. The weather was fine and by the time we hit CP1 at Hayburn Wyke, the sun was out. I had two 500ml soft flasks and had only drunk half of one (note to self, drink more early on), so the option for some Dandelion & Burdock drink and a handful of jelly babies seemed in order. 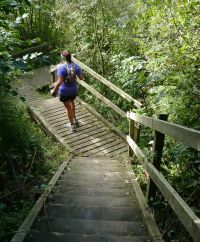 We joined the Cinder Track and returned to Ravenscar, with Kath who was suffering from jet-lag having just returned from the other side of the world, and Kathryn who was suffering from a bout of giddiness, so much so that we banned her from any more cola at the next checkpoints. Undeterred, Kathryn sang her heart out to provide some musical accompaniment, the ‘bam-ba-lam’ of her tune keeping our cadence alive. 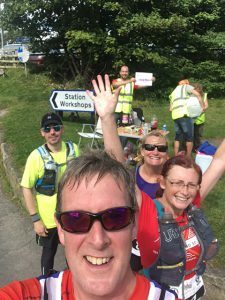 We approached CP2 at Ravenscar village hall and paused briefly for some water and refreshments. And on we pressed, where my first navigation test presented itself – left or right. Intuitively (as the map was well tucked away), I called left, and we joined the Cinder Track to Robin Hoods Bay and CP3, located conveniently beside some Public Toilets. Prawn Cocktail crisps were gladly received at this point. We then had some more Cinder Track miles which felt hard on the legs, and we were pleased (understatement) eventually to reach Whitby, where having amused some good tourist folk as we dashed through the town, we had the 199 steps to climb to Whitby Abbey. The race instructions said we had to run them, and foolishly I did initially but with the wind taken out of my sails, I settled for a more sedate pace (walk) to the top. Battling the urge in passing the ice-cream van, we pressed on along the cliff path, and we gladly reached CP4 just past the Saltwick Bay mini-market. The marshalls at CP4 were delighted to see us, and we replenished our stocks of water, prior to continuing along the cliff top path. The next stretch seemed to go on forever, and we ran past cows, up hills, up more hills, and eventually reached CP5 (which was the earlier CP3). It was at this point that I thought the CP team were doing a weird dance, waving their arms – in fact, they were trying to describe the horror of the ups and downs that lay ahead. Then the downhill stretch into Robin Hoods Bay – torture on the legs because although part of me wanted to cover the ground faster, my sensible side told me that a gallop downhill at this point would end in disaster. 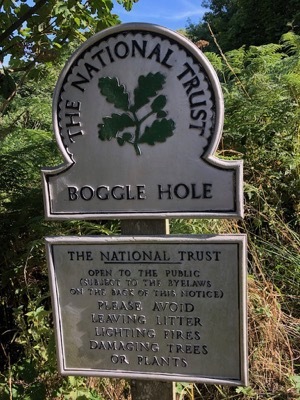 What goes down must go back up, and we ascended countless steps up onto the Cleveland Way, heading to the delightful Boggle Hole – a lovely Youth Hostel apparently but a tortuous descent and ascent to escape towards Stoupe Beck. Our route description said simply, ‘Ascend the steps’ but there was nothing simple about this. Our pace had suffered on this stretch – the challenge of multiple descents and ascents taking their toll. At one point, I became delirious that we had passed the marathon distance, and promptly took an unplanned dive for the deck. Pride dented, we pressed on, and Ravenscar was in our sights but still some distance away. There were some fairly brutal climbs, the worst perhaps being past the Cleveland Way Alum Works but we emerged past the National Trust centre at Ravenscar to familiar territory and the short climb up to the village hall. We managed a graceful trot to reach the welcome sight of Ravenscar village hall and the finish (in 7:23:58)! Those present (including Kathryn who had fled from us in the final section) gave us a clap and a cheer, and with medals in hand, we enjoyed a fantastic chip butty with salt, clapping and cheering for Kath and Claire (who had joined us earlier in the race) stormed through the door. We bid our farewells and headed for the hills! I’d urge anyone with ultramarathon curiosity to have a go at the next Princess Challenge. 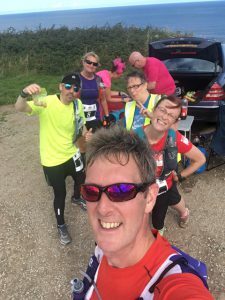 Sure, it’s a tough race with over 1100m of climbs but what makes it easier is the camaraderie of the organisers and marshalls who do a fantastic job – most are accomplished ultramarathoners in their own right. The cola, dandelion and burdock, food and friendly cheer served up at the various checkpoints would galvanise the weariest of souls. I really enjoyed the feeling of isolation, particularly on the cliff paths, with the odd reminder of us being in Yorkshire, as friendly hikers passed in the other direction with the odd, “Eyup”. I learned that next time, I need to drink more early on. I also might experiment with my choice of Cliff bars – I had two during the event but found the dry consistency challenging. Yes, it was tough and hurt in a different way to a road race but on 2nd September, I became an ultramarathoner. 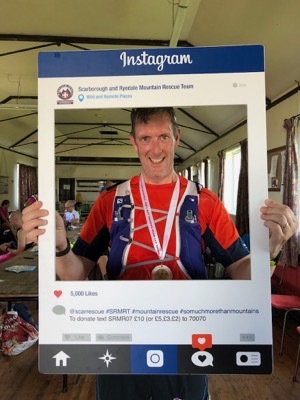 I’m grateful for the support of Lesley, Andy, this club, and Kelly and her team, including Scarborough & Ryedale Mountain Rescue Team who make the event happen. The Princess Challenge is a fundraising event for the Scarborough and Ryedale Mountain Rescue Team. 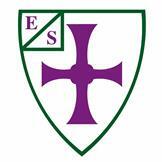 If you can support their vital work via a donation, please do so here. You can also relive the route via this link. Last Saturday as we drove from Durham towards Whitby and the sunrise turned the North York moors from grey to purple, I wondered what on earth had possessed me to get up ‘mind numbingly early’ (as Anita Dunseith had put it) to go and run for 30 miles. I had never run anything longer than 26.2 on the flat, comfortable tarmac. And here I was about to attempt my first mini-ultra on rolling terrain and coastal paths. 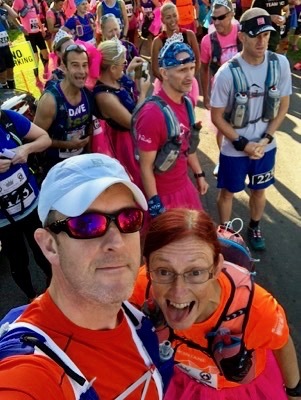 I’d always vowed I’d ‘never run a marathon’ and ‘ultra runners are just insane’… and yet I ran the marathon I’d vowed I’d never do and the thought of trying an ultra niggled away at me until the point that I knew I had to at least give it a go. 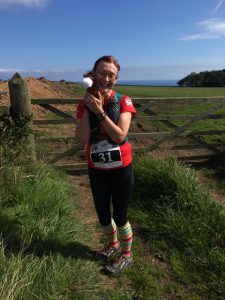 I’d heard and read about the Hardmoors races and fancied trying one of them so when the Princess Challenge was announced it seemed the perfect way to dip my toe into ultra running. 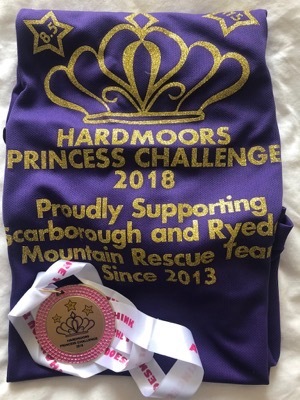 The Princess Challenge is the Hardmoors Charity Run, the proceeds from which go to the local Mountain Rescue. My lovely Dad was rescued in January by Edale Mountain Rescue when he slipped and broke his ankle in three places while out walking in the peak district so this run felt like a good way to say a tiny thank you to those amazing volunteers. The sky was crisp and clear as we set off south along the coast path. The terrain was quite tricky underfoot ( a mix of grass and narrow path) but every now and then we had to slow down to look down at the ocean and say wow! The sun had risen and sparkled off the water and at the risk of sounding cliched it was simply stunning. We then turned off the coastal path and headed back towards Ravenscar Village Hall. The first checkpoint. 8 miles of this run completed. Not really being used to the way these races worked I was surprised that we spent a few minutes hanging about the checkpoint, chatting, using the loo…and drinking cola. I hate coke. I never drink coke. The coke tasted like nectar. I was just starting to flag a little (Mel and Kath set a cracking pace whilst chatting away merrily!) when a marshall waved at us and said that the next checkpoint was only a couple of hundred metres away. A couple of hundred metres that included some very steep steps down. Ouch! The warm welcome at the checkpoint cheered us up considerably and the person who had decided to supply chunks of watermelon was simply a genius. And then it was into Whitby. The sun was shining and Whitby was heaving with tourists. Many of whom seemed bemused to see sweaty runners wearing bizarre jet packs weaving in and out of them. “Is it a sponsored walk love?”….”yeah, well, sort of!”. Mark Dunseith had caught up with us at this point and he decided he’d stop for an ice cream. This was the moment I realised I was loving this run. How many other races have you done where it’s perfectly acceptable to stop for an ice cream? We climbed the 199 steps to Whitby Abbey, heeding Flip’s warning not make friends with any black dogs. I also tried not to make friends with the slightly tipsy bloke who offered me “£35 quid for your backpack love, you’ve only got chocolate in it”. When I declined (and pointed out there wasn’t any chocolate. Like there would be chocolate after 20 miles!) I had to spend the rest of the climb up the steps explaining why and what we were doing. Fortunately although he rather liked my jet pack, he was less enamored with the idea of joining us as we ran off again along the cleveland way at the top of the steps. Now we were heading homewards. 10 miles to go. I’d be entering unknown territory and tried to stay mentally calm. Inside I was having a bit of a wobble, would I be strong enough to finish this run? The coastal path back to Ravenscar was beautiful, the sun was shining and the cliffs rose in sharp definition against the sea. But oh the steps! So many steps, down into the ‘holes’ and back out again. Periods of exhilarating running along flattish paths only to be greeted with more steps. At 22 miles I hit the wall and my legs decided to call it a day. I’ve never experienced that before. “But its flat, I should be running” I whined to Kath. In her wisdom she just said “eat something”. One marmite and almond butter sandwich later and everything seemed a little brighter. Maybe I was strong enough, maybe I could complete this run. We started laughing at the steps, joking and chatting with the walkers we passed and thanking the lovely ladies who cheered us on with “you go girls”. We passed 26.2 miles and I felt a little overwhelmed. The furthest I’ve ever run in my life and I’m loving it. The last few miles pulled steadily uphill but we were getting there. And then the final few metres of the run, turn right past the church and there was the village hall. As we walked in everyone clapped which overwhelmed me all over again! Then we were handed the best and blingiest medal I’ve ever seen in my life. And then I got to sit down and eat my own body weight in pizza and drink 10 cups of tea. My aim had been to finish the run and finish smiling. I did both! It was an amazing experience, the Hardmoors organisation, welcome and camaraderie is legendary and I can confirm its all true. Such a generous and encouraging group of people, even to newbies like me. 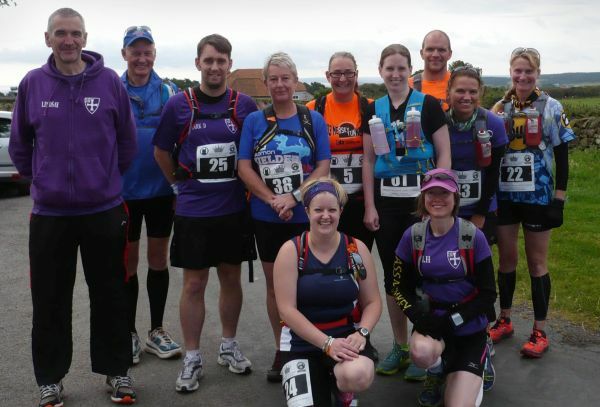 If you want to run in a beautiful part of our country, meet some fabulous people, challenge yourself to do something you’d never believe you can do and get to eat as much cake as you like then get yourself signed up for a Hardmoors event. I’m just off to check out their race calendar for the rest of the year….